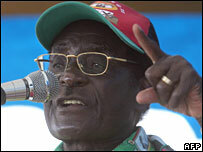 "Just dare try it," said Mr Mugabe at one of his final campaign rallies. "We don't play around while you try to please your British allies." The opposition says the government is planning to win by systematically rigging the ballot. "Mugabe intends to steal this election," said opposition official Tendai Biti. Opposition leader Morgan Tsvangirai says there has been an "upsurge" of support. But he said he was wary of "manipulation", saying winning the vote did not mean winning power. Mr Mugabe's other main opponent, ex-minister Simba Makoni has said it could take 10 years to rebuild the economy - which has seen four in five people unemployed and inflation at over 100,000%. Speaking in the eastern district of Nyanga, the 84-year-old president accused the opposition of lying about the threat of rigging - and warned that he would not tolerate any Kenyan-style violence if the opposition lost elections. Tens of thousands of "ghost voters"
"When you join a political fight by way of an election, you must be prepared to lose. If Zanu-PF [ruling party] wins, you must accept it, if you win we will accept," he said, in comments quoted by the state-owned Herald newspaper. At a ceremony in the capital, Harare, Mr Mugabe handed out ambulances and cars to medical workers - the latest of what his critics say are blatant election bribes. The opposition also says the government is planning to rig the elections, with the help of Israeli computer experts. "They are thoroughly organised, thoroughly computerised," said Movement for Democratic Change Secretary General Tendai Biti. Indigenisation and Economic Empowerment Minister Paul Mangwana earlier told the BBC that reports alleging that they had printed millions of surplus ballot papers were false. "There's nothing this government has done to cheat on the electoral process." He added that Zimbabweans wanted him to continue leading them. "People know the contribution he has made to the well-being of Zimbabwe and Zimbabweans in particular. So they love him and they want him to continue leading them until he completes the goals of the revolution." It's a country without hope with a dictator who will stop at nothing to remain in power. 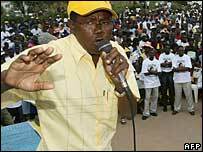 Earlier, a former Mugabe loyalist spoke openly about the possibility that the president might be defeated in poll. 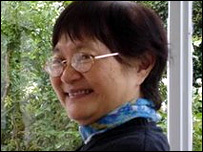 Former Education Minister Fay Chung told the BBC that the two main rivals could win if voters were "courageous enough to come out in large numbers". In an interview with the BBC, Mr Tsvangirai said he was impressed with the level of support he had received, particularly in rural areas, while campaigning for this weekend's local, Senate, House of Assembly and presidential elections. "I have no doubt that we have overwhelming support. In fact, the Zanu-PF may actually find it difficult to suppress... the upsurge on the ground." Nevertheless, the leader of the Movement for Democratic Change (MDC) said he was not sure that popular support would mean power. "This is the crisis we faced in 2002 and 2005," he said. "Although we had the support of the people, we didn't manage to win the election." "This manipulation undermines the will of the people. This time around, we hope that we are able to mitigate against some of the possible manipulation." Meanwhile, Mr Tsvangirai's pilot has been charged with fraud, for checking into a hotel room booked in someone else's name, the MDC says. MDC treasurer Roy Bennett says this has hampered Mr Tsvangirai's ability to address rallies in rural areas. A majority of Zimbabwe's voters live in rural areas, where Mr Mugabe has traditionally enjoyed his strongest support. The US and the EU have accused Mr Mugabe of rigging previous elections - charges he has denied. Western monitors have been barred from this election. Mr Tsvangirai said that if he was elected president, the people of Zimbabwe would be given the chance to rewrite their constitution. He also called for new policies to address Zimbabwe's economic crisis, which has seen the country's annual inflation rate hit 100,000% - the world's highest. Ms Chung, a Senatorial candidate now allied to Simba Makoni, also acknowledged there was a potential for violence similar to that witnessed after the Kenyan presidential election last year, regardless of the result.